SSC CHSL Recruitment 2015-16 Last Date Extended for Apply Online: SSC had released notification for extending last date to apply online for receipt of applications to 17.7.2015 for Part-I and 20.7.2015 for Part-II. As the candidates are facing system problem/ system error in submitting their online application for SSC CHSL Recruitment 2015-16 online application forms. Due to this reason SSC had decided to extend the last date to apply online for Part I & Part II. This reason behind the extension of last date is discussed in the last notice released by SSC for recruitment of CHSL (10+2 Level) LDC DEO 2015-16. Click here to download official notice for SSC CHSL Recruitment 2015-16 LDC DEO. Check SSC CHSL 2015 Notification- SSC CHSL Recruitment 2015 Apply Online for SSC LDC DEO ssconline.nic.in.S SC CHSL 2015 Notification has rescheduled to be available on 13th June 2015 on official website www.ssconline.nic.in. It was going to be advertised on 06th June 2015 but due to administrative reasons, the date of release of official notification has postponed to new date 13th June 2015. SSC had released official notice of postponement of advertisement on 02nd June 2015. 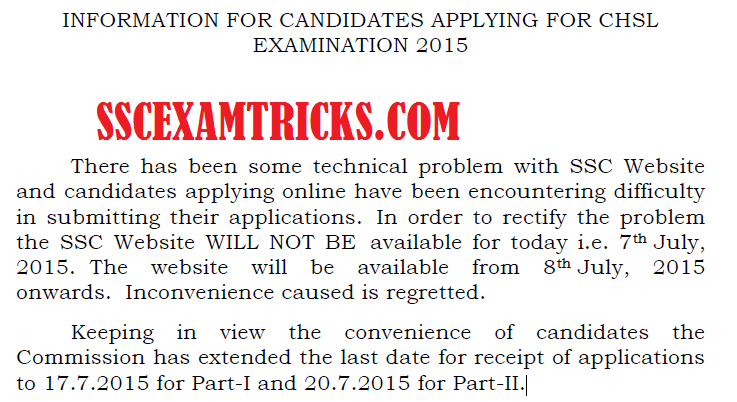 The eligible and interested candidates can apply online application from 13th June 2015 for SSC LDC DEO 12th level exam 2015. The last date to apply online application will be 13th July 2015. SSC CHSL 12th Level Exam 2015 is scheduled to be conducted on 01st, 15th & 22nd November 2015 at various centres in all over the country. It is latest news that around 18 lakhs candidates are waiting for SSC CHSL 2015 notification. They are also preparing from various coaching institutes for short cut tricks to achieve cut off marks in SSC CHSL Exam 2015. Candidates can download Reasoning tricks, English Tips Techniques, Math short cut tricks with memory techniques based on Time Management concept of read once and memorize forever to achieve good result and cut off marks in SSC CHSL Exam 2015. All eligible candidates can apply online for SSC CHSL 2015 on official website www.ssconline.nic.in. 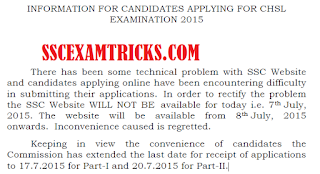 It is suggested to the candidates that they should read in SSC CHSL 2015 notification about candidates age, qualification required, process to apply online, pay scale of post advertised and grade of posts are mentioned in detailed advertisement for SSC CHSL 2015 which can be downloaded from the direct link given on this page. Also check here Haryana JBT Teachers Final Selection List, Chandigarh JBT NTT Document Verification, Chandigarh TGT recruitment latest news. · Download Official Advertisement and read General Guidelines to the candidates carefully before applying online for SSC CHSL Recruitment 2015 for LDC DEO Posts. · Go to Examination and Click on Part I Registration. · Fill particulars in BLOCK LETTERS in SSC CHSL 2015 online application form. · Don’t leave Red Marked column blank in SSC CHSL 2015 online application form. · Recheck all the filled details in SSC CHSL 2015 online application form. · Click on the submit button for Part I registration. · Download SSC CHSL 2015 challan for application fee. · Take print out of Part I Registration and Note down Registration ID and Password for Part II Registration. · Click on official link to apply for Part 2 Registration. · Note down application number and password for SSC CHSL online application form. · Take print for SSC CHSL 2015 Entrance Exam. Visit Regularly on sscexamtrick.com for getting latest news about SSC CHSL latest jobs, admit cards, results, scorecard, counseling schedule and document verification of the candidates. Furthermore readers can download tips-tricks & General Awareness questions answers sets for SSC CHSL 2015 prepared from most popular books to the candidates to achieve cut off marks for SSC CHSL 2015.